Hopewell City Hall is located at 300 North Main Street, Hopewell, VA 23860; phone: 804-541-2243. Photo: Weston Manor, ca. 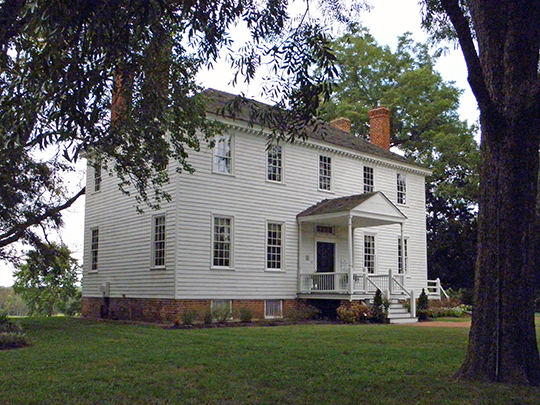 1780, Virginia Route 10, Hopewell, VA. Listed on the National Register of Historic Places in 1972. Photographed by User:AJ Belongia (own work), 2012, [cc-by-3.0 (creativecommons.org/licenses/by/3.0)], via Wikimedia Commons, accessed February, 2014. Hopewell, the youngest of Virginia cities but one of the oldest Virginia communities, has broad streets but many of its houses show that they were built in haste during the boom days. At the outskirts, lanes wind to old houses that stand aloof to the inroads of progress. Hopewell owes its origin and its recent development to its position at the confluence of the two rivers, for ocean-going vessels can reach its harbor on the James River and smaller vessels can run up the Appomattox River to Petersburg. City Point, now part of Hopewell, first lay within Bermuda City (renamed Charles Hundred), a plantation laid out by Sir Thomas Dale in 1613. In 1619, when four "corporacouns" were formed, City Point was one of the hundreds in the Charles City Corporation. Its first designation, Bermuda City, was changed to Charles City, lengthened to Charles City Point, and later abbreviated City Point. But on March 22, 1622, its population was almost entirely wiped out during the Indian attack and the city did not materialize for many years. However, the deep waters off shore served the cities of Petersburg and Richmond as a harbor and in both the Revolution and the War between the States it witnessed naval and military maneuvers. Hopewell is a city that munitions built. After the E.I. du Pont de Nemours Company erected its munitions plant on Hopewell Farm in 1913, the city was born. Incorporated July 1, 1916, it had during America's participation in World War I a population of approximately 40,000, augmented from time to time by soldiers from Camp Lee, five miles away, who came to Hopewell on their days of leave. Houses for workers went up overnight; large and small businesses prospered. After the lull that followed the signing of the Armistice, steady growth began with the coming of peacetime industries. Now factories stretch far and wide within and beyond its corporate limits, and the air is filled with both profitable odors and sulphuric smoke. Several huge mills produce kraft and synthetic textiles, and an enormous plan lives off air, using the synthetic ammonia process for the fixation of the inactive nitrogen in the atmosphere. Other products of Hopewell are pottery, car liners and doors, insect sprays, sheet metal, machine equipment and building supplies.